Our client, a civil engineer, wanted a comfortable house for her family on a .7-acre lot located not far from her office. She asked for three bedrooms, a two-car garage, and a swimming pool. More importantly, she wanted a house that expressed her belief that good design can change people’s lives. And she wanted the roof to be flat. Her site was a half-acre lot on a hillside that faced east, in a neighborhood in North Raleigh that was changing. For 60 years this neighborhood had sheltered families with modest ranch homes and gardens that were close to schools and shopping. Now developers were tearing down those ranch houses to build McMansions and planners recommended a five-story apartment building nearby. 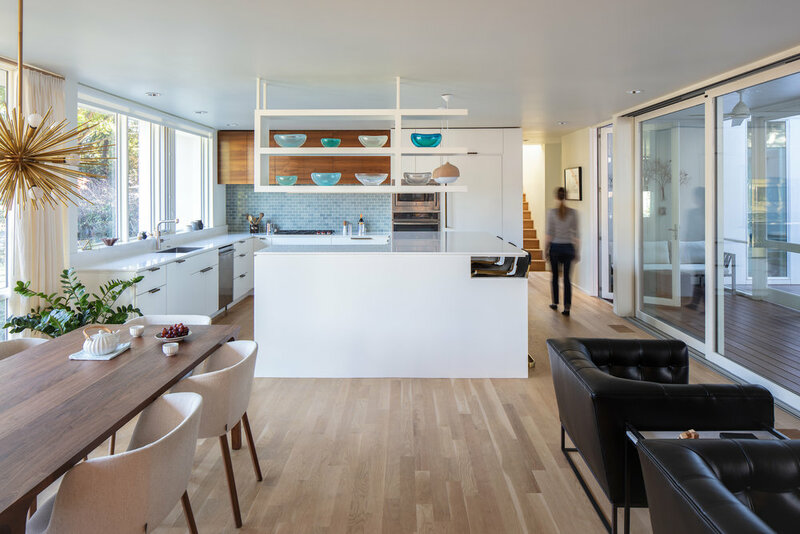 We thought her house should be spacious and sheltered from its evolving neighborhood. We grouped the living spaces around a courtyard and pool. We aligned the living room, dining room, kitchen, and a screened porch to catch the prevailing southwest summer breezes. To shield these private living spaces from the street, we planted three parallel hedges. The hedges provide privacy from the neighborhood yet allow the family to enjoy views of sunrises. 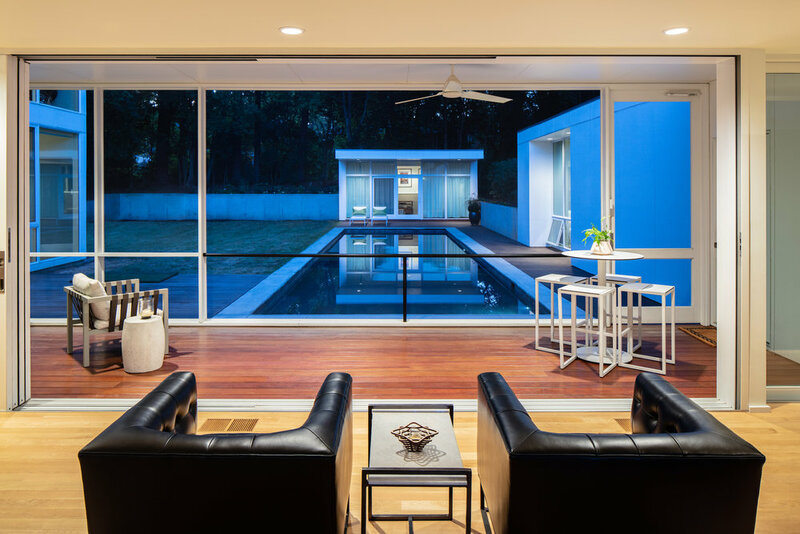 A 24-foot-wide sliding door opens the house to the pool, the courtyard, and a distant music pavilion. On summer nights, the sound of music flows through the windows. A zinc-covered roof embraces the northern and southern exposures, helping to insulate the house from its shifting neighborhood.